You've been told that you need immediate dentures. But what are they and how are they created? Here you will find the answers to those questions and other information about this type of denture. Your Denturist will be the guide to your needs for immediate dentures. When is an immediate denture used? To avoid being completely without teeth, your Denturist will employ an immediate denture solution. He will take an impression of your mouth while your natural teeth are present. The Denturist will then fabricate a denture to resemble your natural teeth or make any necessary modification. Once your natural teeth are extracted, your immediate denture is inserted. You have avoided living without teeth while completing the healing process. Because you will not be able to try the denture prior to tooth extraction, certain esthetic adjustments may be needed. This will not pose any significant problems and results are normally excellent. It is important to follow all of your Denturist or Oral Surgeon's postoperative instructions. 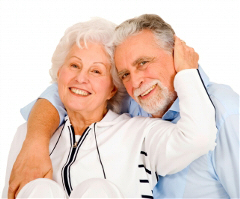 As healing occurs and oral tissues recede, some denture adjustments may be needed. It is vital that you schedule follow-up appointments with your Denturist. A temporary liner or conditioner may be placed in the denture to maintain maximum fit and comfort. You will notice that bone and gum tissue will shrink to some degree; this rate of change decreases with time and is to be expected. When the healing process is complete, your dentures will be relined or rebased or a new permanent full denture(s) will be made. Your Denturist will recommend the right option for your particular needs. Contact your Denturist to see if immediate dentures are the best option for you.